When you tell folks you live in Florida, they think beaches and constant sunshine. They don’t think about rainy days, thunder, lightening or even cold weather. Yes, in the northern part of Florida, we have cold weather. It’s a different kind of cold, though. It’s damp and seeps into your bones. The chill just never goes away. Anyway, I am preparing for that cold weather when I walk my dog this winter. I made a wool hat, wool mittens and wool cowl. I may make my dog a sweater or maybe just get a sweatshirt from the Goodwill and “adjust” it to fit her. 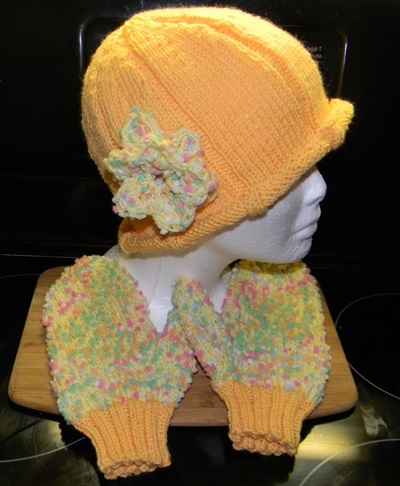 This photo shows the completed mittens and the hat in progress. And this shows the cowl, hat and mittens completed; all made with wool. These should help with the cold and chill this winter. ETA: OMG! How could I forget!?!?!?! For those of you who knit, this Baa-ble Hat is a free pattern on Ravelry. 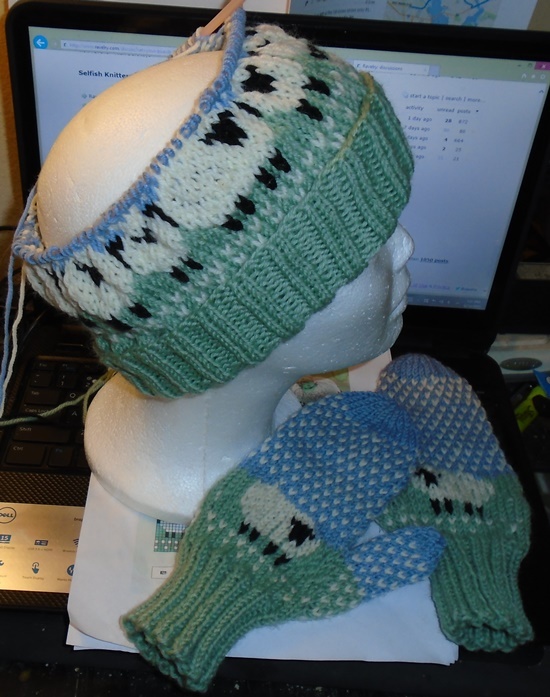 I used the graph to add the sheep to the mittens and the cowl. 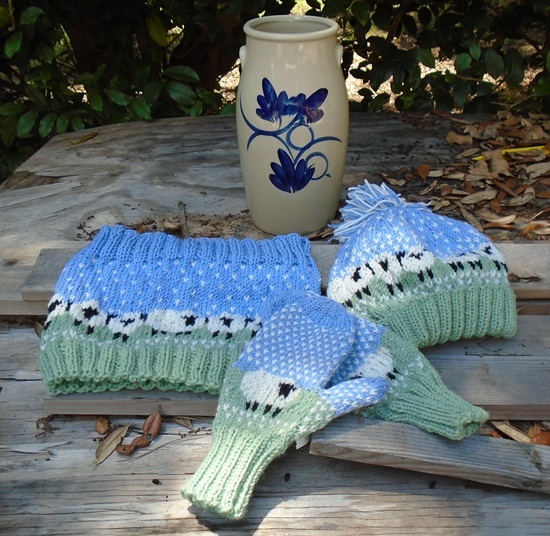 The mittens are basic mittens (c/o of 40 sts; US 4 needles) and the cowl uses the same number of stitches as the hat, after the increase (120 sts); only it is knit on larger needles (US 9). Today I thought I would post a couple of knitting projects for any of you who want to keep busy while it is sub-zero outside. With US 4 dpns, cast on 40 stitches using CC. Divide evenly over 4 needles and K2P2 for 2 inches. K one round in CC. Change to MC (dippity dots) and K 2 rounds. 3. M1, K1, M1, SM, K to end of round. 5. M1, K3, M1, SM, K to end of round. Continue in this manner until you have 13 stitches before marker. Then, K13, SM, K remainder of stitches on needles. Slip the first 13 stitches before marker to waste yarn or ribbon. Remove marker. Continue knitting around and join . Continue knitting around until you have 6 – 6 1/4 inches above cuff. Begin decreases. K2tog around. Slip stitches to 2 needles and kitchner stitches together. This will be difficult as you will be pulling the dippity dots yarn thru the loops and it will stick. You will have to be patient and manipulate the yarn thru the loops. Slip the 13 stitches to 2 needles. Pick up 3 stitches at join and divide stitches as evenly as possible. Join MC yarn and knit for desired length (about 2″ from join). K2tog around, slip yarn thru loops on needles and secure. Again this will be difficult as the dippity dots will tend to “catch” on the loops. Be patient and you will succeed. Using US 5 circular needles, CO 120 stitches in CC. PM every 30 stitches. Join and K one round. Then P one round. K13, P2 around until you have knit 1.5 inches from cast on edge. K 12, P2 around for 6 inches or desired length from beginning. K2tog, K4, K2tog, K4, P2 around. K2tog, K3, K2tog, K3, P2 around. K2tog, P2tog. End by cutting yarn about 10 inches out and run through loops on needles. Secure end. Weave in all loose ends. Block hat as necessary. Add decoration of choice. I crocheted a flower in the Dippity Dots yarn to match the mittens. You could knit a flower or a band or a strip to tie into a bow or an i-cord. Use your imagination. Notes: I did not block this hat. I like the curled up edge. If you wish, you can block the hat into a more bell shape. 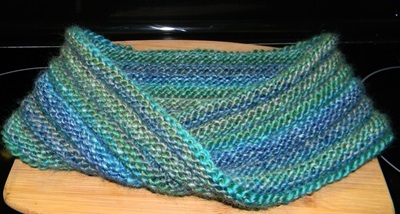 This is a moebius cowl that I did using US 8 circular needles 47″ long and following Cat Bordhi’s moebius cast on method. Her method can be found on YouTube. I began with a cast on of 100 stitches and followed her instructions for round #1. After that, I knt 4 rounds and then purled 4 rounds and continued in this manner until I was almost out of yarn. Then I did a standard bind off. The yarn I used was Red Heart Boutique Treasure. It is 70% acrylic and 30% wool. Feels really soft.